Jäger is a pretty protective big sister, so when her doggie brother tries to hop in the pool for a dip, Jäger's first response is, "Oh no!! He's drowning!! I must save him!!" So, she immediately pulls her brother out of the pool and onto dry land, despite his protests. 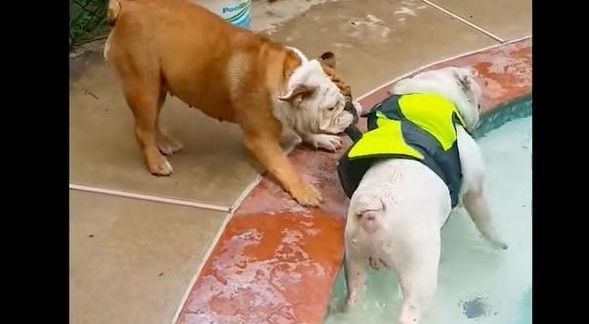 And then, as soon as her brother tries to get back in the pool, Jäger pulls him out AGAIN. Maybe she doesn't trust that life jacket. Poor guy will never get to go swimming. NOTE: Generally, Bulldogs are known for getting along well with children, other dogs, and pets. They can become so attached to home and family, that they will not venture out of the yard without a human companion. They are also more likely to sleep on someone's lap than chase a ball around the yard. Bulldogs are recognized as excellent family pets because of their tendency to form strong bonds with children. Responses to "Protective Big Sister Will Not Let Her Brother Get In The Swimming Pool "
Being a typical bulldog, get a hold of something and won't let go.